Bha mi a’ bruidhinn air Skype ri oileanach Gàidhlig anns na Stàitean Aonaichte agus fhuair mi a-mach gu bheil gach duine eòlach air an fhacal ‘bannock’ ann an Ameireaga a Tuath mar ainm a th’ air aran simplidh a nì luchd-campachaidh, agus gum bidh mòran daoine a’ creidsinn gur e facal a thàinig bho na treubhan dùthchasach Canèidianach (leithid Cree) a th’ ann. Tha e coltach ged-thà gun d’ fhuair iad am facal – agus gu ìre na reasabaidhean bunasach fhèin – bhon luchd-tuineachaidh Albannach, gu h-àraidh bhon luchd-seilge, aig an robh mòran ceanglaichean leis a’ mhuinntir ionadail an sin. Bha iadsan air an t-slighe fad na h-ùine agus a’ dèanamh bhonnach air an tèine-champachaidh, le min-fhlùir, uisge agus ‘s dòcha beagan saille is salann, air maide, air clach no air greideal. Cha robh na treubhan eòlach air min-fhlùir à gràn mar chruithneachd, eòrna no choirche ro sin, ged a bha gràin fiadhaich agus sìol dùthchasach eile aca a rèir coltais leis an dèanadh iad ‘frybread’, taois air a fraigheachadh ann an saill. Chan eil na h-eòlaichean ag aontachadh mu na tùsan mionaideach den fhacal, an tàinig ‘bannock’ bho ‘bonnach’ no a chaochladh, no an tàinig an dà chuid de sheann fhacal Ceilteach no às an Laideann (panus = aran, panicum = bathar-àmhainn). Ach tùsan ann no às, bha am facal ga chleachdadh mar-thà anns na Meadan-Aoisean, ann an Alba, Èirinn agus Sasainn a Tuath air seòrsa arain sìmplidh gun bheirm air a dhèanamh air clach chòmhnard san tèine no air greideal iarrainn. Bha a’ ghreideal gu math cudromach dha na daoine fad nan linntean leis gun robh mar as àbhaist ach aon àmhainn anns a’ bhaile is i aig an fhuineadair. Chaidh mòran seòrsan bathar-arain no cèic a leasachadh gu sònrachte airson na greideil, mar eisimpleir sgonaichean (“girdle scones” seach “oven scones”) agus foileagan Albannach (“dropped scones”), gu h-àraidh às dèidh do phùdar-fuine nochdadh. Nuair a bha mi fhìn na b’ òige, bha sgonaichean is foileagan blàsta ùra againn aon no dà thuras san t-seachdain, rin ithe blàth le ìm, agus chan ann san taigh againne a-mhàin a thachair sin. Bha an greideal na ìnneal-chidsin riatanach air feadh na Gàidhealtachd. Ach an latha an-diugh chan fhaic thu iad ach ainneamh, agus cha lorg thu iad rin reic sna bùithtean idir. Saoil am bi iad a’ tighinn air ais san fhasan latha air choireigin? Agus dh’fhàs na bonnaich fhèin na bu dhiofraichte agus na bu bhlasta, le dearcan tiormaichte is siùcair, agus fiù ‘s gam bruich san àmhainn aig a’ cheann thall, mar an ‘Selkirk Bannock’ ainmeil, cruthachadh aotrom milis. Ma bhios tu a’ googladh raiseabaidhean-bonnaich an latha an-diugh, ann an Canada no ann an Alba, ‘s gann gun lorg thu dad ach tionndaidhean le siùcar, agus mar as àbhaist ugh is bainne cuideachd, agus iad uile rin deasachadh san àmhainn seach air a’ ghreideal. Slighe fhada gu dearbh bho bhonnach trom simplidh nam Meadhan-Aoisean, no bhon fheadhainn aig an luchd-seilge Canèidianach – càil ach measgachadh de mhin-choirce, uisge is beagan saille! I was talking on Skype to an American student of Gaelic and discovered that everyone over there knows the word ‘bannock’ as a kind of simple campfire bread, and that many people believe that it’s a Native Canadian word (e.g. Cree). It seems likely, however, that they got the word, and to some extent the basic recipes themselves, from the Scottish settlers, especially the hunters, who had a great deal of contact with the local tribes while on the trail, and who would make bannocks of flour, water and maybe a bit of fat and salt, on a stick, on a flat stone or on a girdle over the fire. The native tribes didn’t know flour made from grains such as wheat, barley or oats before then, though they did apparently have local wild grains and seeds with which they made ‘frybread’, dough fried in fat. 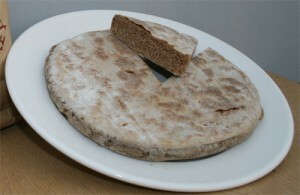 Experts disagree on the exact origins of the word, whether ‘bannock’ came from ‘bonnach’ or vice versa, or whether both came from an old Celtic word or from Latin (panis= bread, panicum= baked goods), but regardless of the origins, the word was already being used in the Middle Ages in Scotland, Ireland and the North of England for a kind of simple bread without yeast made on a flat stone or an iron girdle. The girdle became very important to people over the centuries as the one oven in a township would usually belong to the baker. Many kinds of bakery were developed especially for the girdle, for example scones (“girdle scones” as opposed to “oven scones”) and Scotch pancakes (“dropped scones”), particularly after the introduction of baking-powder. When I was younger, we had tasty fresh girdle scones and pancakes once or twice a week, eaten warm with butter, and that wasn’t just in our house. 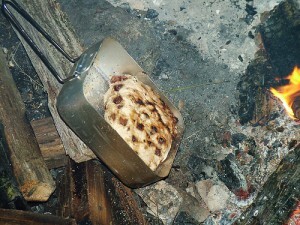 The girdle was an essential kitchen item throughout the Highlands. But nowadays you’ll rarely see one, and you can’t buy them in shops at all. I wonder if they’ll come back into fashion again some day? 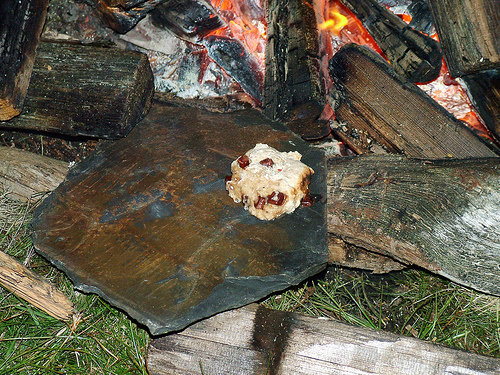 Bannocks themselves also became more varied and tastier with the addition of currants and sugar, even being baked in the oven, like the famous Selkirk Bannock, a light, sweet creation. 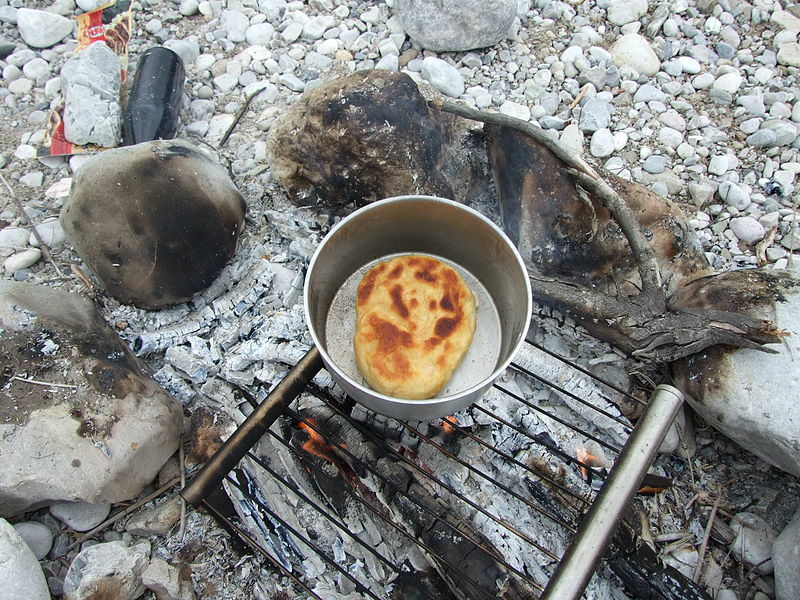 If you google bannock-recipes today, in Canada or Scotland, you’ll hardly find anything except versions with sugar, and usually egg and milk as well, all to be baked in the over instead of on the girdle. All this is a long way indeed from the simple, heavy bannock of the Middle Ages or of the Canadian hunters – nothing but a mixture of oatmeal, water and a bit of fat! Photos: all Creative Commons. 1)Lou Sander. 2) + 3) Ellyll on Flickr. 4) Carl Steinbeisser.